The tailored jacket with matching trousers remains the uniform of official power. Custom made dress shirts should yield a collar-set that distinguishes your face and cuff-fit that dresses your hands. A necktie’s motif, or pattern, expresses the poetry, the sense of whimsy, the psychology of the individual wearer. 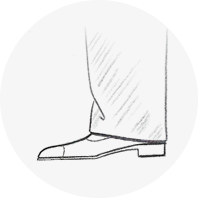 Like most apparel, a man’s footwear should be an extension of his personal style. Generally, dress belts should be of an equal or darker shade than the suit. The experienced dresser will use the brace’s color or pattern to frame the ensemble’s composition. Like a good haircut, the best-folded squares are those that do not draw attention to themselves. The blazer remains the most versatile single tailored garment in a man's wardrobe. The custom made tuxedo represents the highest expression of tailoring art and sartorial know-how.